Many parents don’t know which route to take when it comes to teaching their children how to become more independent and responsible. Is there a way to teach this from an early age without putting too much pressure on the child? How can we teach kids to see work from a different point of view? And most importantly, what should our expectations be regarding what our children can do given their age? 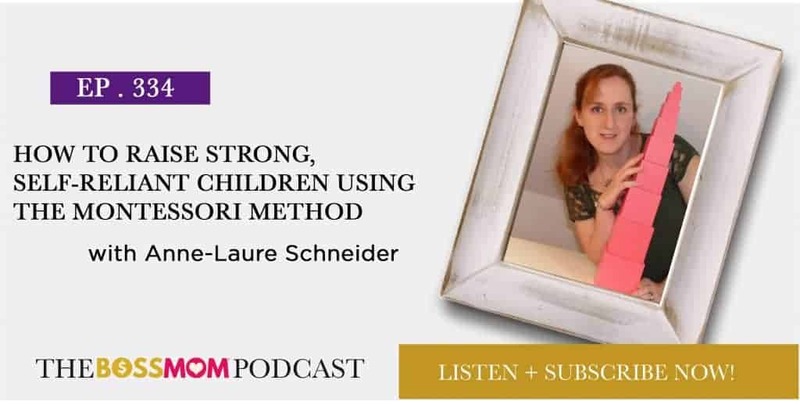 In this episode, Anne-Laure Schneider shares how she became a Montessori educator and how the Montessori method can help you raise independent-minded children. If we don’t like the context, why not change it? If the schools aren’t providing the level or type of education our children need to grow, we have to become proactive about it. This sometimes translates to teaching ourselves how to help our children improve their learning processes and become more independent. Children can be easily taught to work independently on their own projects, perhaps while we work as well. Empowering children to do some things on their own helps them become more confident in their abilities and prevents them from constantly trying to get our attention. The biggest misconception about the Montessori method is that it doesn’t let children live out their childhood. Many children actually love to help their parents out, and pretend they want to feel like adults too. For them it’s all a game, even when they do chores. There are so many things children can do at an early age, but parents are often afraid of seeing our kids grow up too fast. Anne-Laure Schneider was a scientist with a degree in Logic from the University of Cambridge. After she had her first child, she fell in love with the Montessori method, which was used at the preschool her child attended. This is how she started her journey to becoming a certified Montessori educator. In the present, she helps moms by sharing her Montessori courses online so everyone can benefit from this teaching method without having to attend a school. LOLA is dedicated to providing you with an ever-expanding portfolio of trusted products and candid information for you to make deliberate decisions about your reproductive health. From your first period to your last hot flash (and beyond! ), we’ll have you covered. Go to www.mylola.com and use the Boss Mom promo code BOSSMOM to save 40% on all subscriptions!